Average household incomes in London's wealthiest areas have exceeded £100,000 for the first time, figures show. 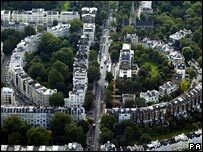 In central London borough Kensington and Chelsea the average income is £101,600 per year, a survey found. London and the South East dominated the list of areas with high earners with Westminster in second place with average household incomes of £81,425. A spokesman for the Barclays Bank survey said: "High incomes are no longer unusual in the UK." He added: "There are now one million individuals in the UK earning over £100,000 a year. "No doubt the influx of high earners, not just from the UK but from overseas, has had a positive impact on average incomes." Researchers looked at data from 5.3 million current account holders to estimate the UK's wealthiest areas. The average family in Kensington and Chelsea has seen earnings rise by 7% over the past year, the survey found. Tatton in Cheshire and the Cotswolds in the South West - with typical household incomes of £62,350 and £60,800 respectively - were the only places outside London and the South East to make it into the top 20.